Ever Try to Quit Smoking? Unless you’ve been living under a rock, you know that tobacco and cigarette smoking are going to reduce your lifespan. With that being said, many smokers are kicking the habit and finding alternative ways to get their nicotine fix, and more and more smokers are turning to electronic cigarettes to satiate their nicotine cravings. They look and act just like a regular cigarette, without all the carcinogens and other harmful chemicals in traditional cigarettes. We’ll take a look at yet another Miami company doing big things in the E Cigarette World. 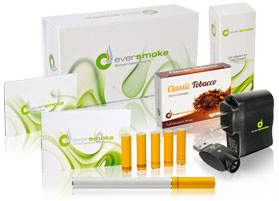 On that note, I’m pleased to bring you my review of Ever Smoke electronic cigarettes. Ever Smoke just came on my radar recently but has quickly made its way among the top brands of electronic cigarettes out there. They have all the things that a vapor cigarette smoker ask for – delivering a great e-cig product, with lots of accessories and kits available as well as some great cartridges. Ever Smoke has become one of the e-cigs that I reach for most often when I need a puff. One differentiator with Ever Smoke e-cigs is the range of nicotine strengths that they have in their arsenal. Their nicotine strengths range from 0mg, for those who just want to replicate the act of smoking but don’t necessarily want nicotine, increasing to 6mg, 12mg, and 18mg varieties. Most brands don’t carry cartridges in this many increments, which is a great bonus for those who are looking to gradually step down nicotine strengths and ease themselves off of their habit. On top of the wide range of strengths, Ever Smoke also stands out because of their many falvors that they have. Ever Smoke utilizes Flavor Max cartridges, which are packed with flavor and have been raved about by Ever Smoke’s loyal customers. Veterans of e-smoking, like myself, enjoy the bold taste they give out, much stronger than other brands. With six different flavors, they have something for everyone. The batteries at Ever Smoke are of the best quality, too. Ever Smoke has invested heavily in innovation and have some of the sleekest, most advanced batteries out there – definitely one of the strongest on the market. They are styled nicely and come in three different colors (stainless steel, white and black) and three sizes (standard, mini and high capacity). And like other brands, they also offer two different battery styles – manual and automatic. The automatic battery is what most e-smokers are accustomed to, just take a pull from it to smoke it. With the manual battery, there’s a button on the side that you press and it creates the vapor for you, all you need to do is inhale it. The manual battery provides a full, voluminous, consistent pull every time. If you’re looking to really dig in to electronic cigarettes, they have some even more advanced kits, like the Ultimate Starter Kit ($109.99) as well as the Ultimate Plus Starter Kit ($154.99) which come with more cartridges, more batteries, carrying cases, car chargers and more. These kits have everything! No matter the reason that you’re looking to buy electronic cigarettes, there’s no better time to quit smoking traditional cigarettes. I’m glad I got introduced to this brand as it’s become a favorite. It’s a high quality product with some great cartridges and a nice array of kits and accessories to satisfy everybody. Definitely give them a try!